Camera is the mostly used app on smart phones, and its frequently required app. Having quick shortcut to launch the camera is always helpful. Samsung Galaxy Note 9 offers the always on display mode, where it allows to enable on screen home button. Always on display also allows to set camera as a app to launch when double tap on home button. To enable this go to Setting -> Lock Screen -> Always on Display. 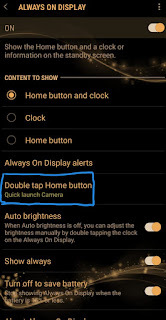 On always on display settings choose action for "Double tap Home Button". To use this shortcut you should also select "Home button and clock" under Contents to shown on the same screen. If you like to save your battery more, you can turn off the always on display on your Samsung Galaxy Note 9. To do so, go to Settings -> Display. Now on display settings scroll down to the end, you will find the always on Display setting. Other option is go to Settings. Now using search bar search for "Always on". Here enable/disable always on display by using the toggle at the top. There are many settings for always on display. One more important is to customize the Always on display timing. You can choose the time period when you want the always on display should be enabled. This is also another great way to save battery and still using this feature. Kafka Connect is a tool for scalably and reliably streaming data between Apache Kafka and other systems. It can also be used in secured Kafka environment. In Kerberixed Kafka installation also you can use the Kafka Connect utilities. You just have to provide the Java security config and Kerberos config as parameters to connect utils. Below command shows how can you specify the security properties to the connect-standalone.sh. The command assumes that you are in the Kafka installation directory. Here the kafka-jass.config should specify the file path which contains the KafkaClient properties like below.